Georgia’s aerospace industry continues to grow. Everyone knows, or should know, that Hartsfield-Jackson Atlanta International Airport is the world’s busiest airport, with nearly 104 million passengers through its gates in 2017. A lesser-known fact may be that the Atlanta airport is just one piece of Georgia’s thriving – and growing – aerospace industry. Additionally, aerospace products are the No. 1 international export from the state at $8.4 billion annually, Hudnall says. Georgia’s aerospace companies make everything from cargo planes to machinery and tool, interior and engine parts. Fast forward to Industry 4.0 – the term for automation and big-data use in manufacturing – and technology is changing everything in the aerospace industry, from how people fly (think biometric airport terminals) to predictive analytics that forecast when an aircraft part may break. Commonly referred to as the fourth industrial revolution, Industry 4.0 includes things like artificial intelligence, the internet of things (IoT), cloud computing and cognitive computing. For 64 years, Lockheed Martin has been producing C-130 military transport planes and modifications or upgrades on P-3 surveillance planes and huge C-5 Galaxy military cargo jets at its Marietta facility. With approximately 5,000 employees, Lockheed is the state’s fourth largest manufacturing enterprise. In the early ‘90s, Lockheed Martin switched from analog to digital technology with the introduction of the C-130J Super Hercules aircraft. The latest version of the venerable cargo plane collects reams of data as it flies. In April, Lockheed partnered with analytics leader SAS to crunch all of that data. Prior to Industry 4.0, if a part on one of its planes broke, Lockheed Martin would launch an engineering investigation to determine why the part failed, but analyzing the plane’s data after a failure cost time and money. Using all of the generated data, such as the temperature of engine parts or the stresses on the airframe, artificial intelligence and machine learning determine patterns that can predict when something is likely to break. In November, Lockheed wrapped up a six-month demonstration for the Air Force’s Air Mobility Command using predictive maintenance technology on the C-130J. Officials hope to be able to predict when certain parts might break before a flight, which could help determine the best aircraft to deploy on a mission, Szalwinski says. Szalwinski says the goal is to bring the technology online with some customers in 24 to 36 months. There are more than 400 C-130Js flown by 18 countries. While instituting predictive maintenance practices throughout the Air Force will take time, commercial airlines already use the technology. In 2017, Delta reported that it avoided 1,000 potential engine events over 12 months largely due to predictive maintenance practices. But, that’s yesterday’s news. And, in March, Delta Biometrics launched across its domestic Sky Clubs, allowing members to use their fingerprints to enter all 50 locations. In 2017, Delta was No. 11 on Forbes’ list of 15 Most Relevant Brands, and this year, Fast Company magazine named Delta one of its 2018 Most Innovative Companies. He points out Delta often turns inward for innovation, supporting the development of new ideas from employees through things like its Global Innovation Center, called The Hangar. In the next decade, Delta plans to hire more than 8,000 pilots. According to Boeing’s Pilot Technician Outlook 2018-2037, 790,000 new civil aviation pilots (206,000 in Georgia), 754,000 new maintenance technicians and 890,000 new cabin crew will be needed to fly and maintain the world fleet over the next 20 years. The forecast includes commercial aviation, business aviation and civil helicopter industries. To help meet its future hiring needs, this summer Delta launched the Delta Propel Pilot Career Path Program to identify, select and develop the next generation of pilots. Delta is initially partnering with eight universities across the country that have accredited aviation programs, including Middle Georgia State University in Macon. Successful candidates will receive a qualified job offer that details a defined path and an accelerated timelime to become a Delta pilot. The School of Aviation at Middle Georgia began as a technical school, but in 2007, it became part of the University System of Georgia. The school’s main campus is in Macon, but their Eastman campus serves as the hub for the aviation program. In Georgia there are five technical colleges, one university (Middle Georgia) and one commercial school offering aviation and aviation-related certificates and degrees. Clark says there are 741 students in the School of Aviation, and 349 of those students are studying to become pilots. 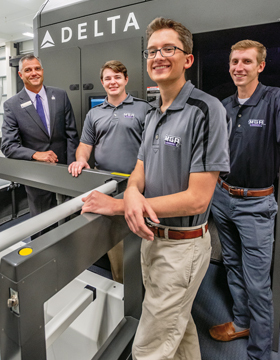 “We’re a small school and have the benefits of a small school, but we’re also a world-class aviation education and training university,” he says. Maintenance, repair and overhaul (MRO) is another large part of the state’s aerospace industry. Georgia occupies the 4th position in rankings of the nation’s most MRO employment, according to the Aeronautical Repair Station Association’s 2016 assessment. Including civilian and military operations, more than 30,000 MRO employees work in the state. Delta Tech Ops is North America’s largest airline MRO and the U.S. Air Force Warner Robins Air Logistics Complex is one of three Air Force depots that does MRO on military planes. HAECO, StandardAero and Stambaugh Aviation are among the state’s other MRO enterprises. The GDEcD recently named Pratt & Whitney the Large Manufacturer of the Year in recognition of the company’s $386-million investment that will create more than 500 jobs over five years. The Columbus facility is responsible for engine overhauls, provides forged jet engine parts and employs nearly 2,000. Gulfstream Aerospace Corp. is also expanding, to the tune of $55 million that will bring 200 new jobs to Savannah with the opening of a new service center in 2019. In addition, the company recently completed an expansion and modernization effort in Brunswick. Gulfstream opened its Savannah facility in 1967 with 100 employees, and today has nearly 12,000 in Georgia. When it comes to workforce development, the company has focused on engaging elementary through post-secondary students along with military service personnel, and recruiting from technical schools, universities and the military, Neely says. “A foundational point underpinning this strategy is that our younger generations need help understanding what great opportunities are available in technical fields, and how to take advantage of those opportunities,” he says. “This awareness work must include students and, likely more importantly, their parents and teachers. So, our approach is to start with young students to build awareness, build desire and, through mentoring and other resources, guide them down the path toward those goals. While Georgians have a gateway to the world through Hartsfield-Jackson Atlanta International Airport, the state’s aerospace industry is setting its sights on the final frontier: space. Seeking to capitalize on the global $304-billion space industry, the county has a site on the I-95 corridor next to the Atlantic Ocean under contract for the development of an aerospace industrial park. Whether it’s manufacturing, MRO, unmanned autonomous systems or the commercial space market, for Georgia’s aerospace industry, the sky’s the limit.